Properties in Luján de Cuyo Department average 4.6 out of 5 stars. 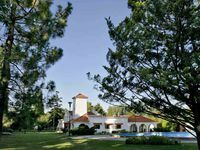 Property 9: Enjoy Mendoza Leisure Time in Chacras de Coria. Property 11: Chacras de Coria, casa con parque y piscina. Ideal para familias. 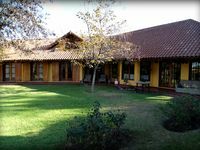 Property 13: House "Las palmeras" in Chacras de coria, Mendoza. Our family of 7 rented this beautiful spacious home in November when we traveled to Mendoza for our nephew's wedding. The house was spectacular and we took advantage of the beautiful pool, the amazing pool house and the soccer field. Our extended family members who were staying in other area residences were jealous because our home was so warm and inviting and our host, Fausto, was so helpful. Fausto helped arrange our transportation, amazing day trips for horseback riding, winery tours and the Termas Cachueta (thermal spas). Fausto provided help with transporting our family members to the wedding venue, and help with a rental van for our use while in Mendoza. The home is very warm and inviting and has ample areas for relaxing in the living room, family room or at the huge kitchen table. We had a dinner in the pool house asado catered by Pablo and Macarena, area chefs, which was beyond incredible. The wines, the salads and the meats were amazing. The beds were comfortable and everything was kept tidy and clean by Soledad, the housekeeper who lives on the property. We LOVED the two dogs who stayed outside and kept us feeling safe at night. The property is near to stores and restaurants, but is in a quiet safe (private security) neighborhood. The kitchen had everything we needed and Fausto provided breakfast items for our use. We have rented many properties over the years in the US and abroad and this was our family's favorite. Fausto was attentive to our every need. We would go back if we could!! There is outdoor furniture for the pool and the grounds are quite beautiful. There is so much room to spread out that you could easily have more than 7 people stay here.